This time you have chance to win this Oumier Wasp Nano RDA. Here you go. 8 sets are waiting for you! Introducing you a new subohm tank from Limitless-Reactor. It is the newest addition to the Limitless Family, features a 3ml e-liquid capacity. Its coil comes in at 0.5 while LMC integrates bottom airflow within the coil.Tying into the adjustable airflow on the tank, makes sure vapers could get a high performance vaping experience while at a relatively lower temperature. It is a har hitting subohm mastrpiece! Plus top fill port for ease of re-fills, it is a one worth of your trying! Introduce the newly released all-in-one device - Aspire Breeze, which perfectly integrates compact size, stylish appearance and good features into a unit. With a vape pod design, it feels nicely almost anywhere including small pockets and is perfect for stealth vaping. It comes with a built-in 2ml tank that is compliant with TPD regulations and refillable. It also adopts a 0.6ohm U-tech coil which will offer you a flavorful MTL vaping experience. As for the operation, no need to press the fire button, just inhale from the drip tip, so convenient. There is also a drip tip protective cap to protect your drip tip, more dust-proof. This Breeze kit is 650mAh in battery capacity, which can be easily charged in two ways, one is through its micro USB port, the other is via a Charging Dock. Simply put, it's decent starter kit for all new vapers. 2ml built-in tank, TPD compliance. Introduce a new kit from SMOK, called T-Priv TC kit, which is a nice combo of T-Priv TC MOD and a TFV8 Big Baby tank. As a new member of Smok Priv mod family, the T-priv can also fire up to at most 220W, powered by dual 18650 batteries. The domineering hollow out design plus the big fire key must kindle your desires. 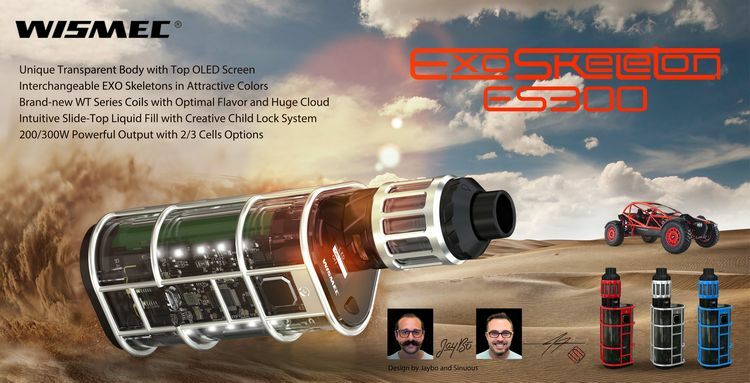 It also comes with easy-to-read OLED screen, providing more vaping data for you. If mentions highlight for the mod, that must be 9-color modes customization led, which definitely brings more enjoyment during your monotonous vaping life. With regard to renowed TFV8 big baby tank, you must be familiar with it. It has standard version of 5ml e-juice capacity and EU version of 2ml. Top refill system makes filling as easy as it gets. Its leak proof e-liquid slot can significantly solve leaking problem. Airflow can be adjusted freely by turning the ring at the base of the tank. 5 shining colors available. How can you miss this excellent kit? Introduce you the newly released Revenger TC Kit from Vaporesso, which is composed of the Revenger mod and NRG/NRG Mini tank. Powered by dual 18650 batteries, the Revenger mod can fire up to 220w maximum to bring you large vapor clouds and perfect vaping experience. It supports various work modes including VT(Ni200,SS,Ti), TCR(M1,M2), RCT, CCW, CCT and BYPASS. The RCT function offers a precise way to know the charging time. Massive 0.96-inch screen and 2A quick charging system upgrades your vaping experience to a new stage. The paired NRG and NRG Mini tanks are only different in e-liquid capacity, which are 5ml and 2ml respectively. Both tanks adopt the interchangeable GT coils for wide range wattages so that different vapers will enjoy their sweet spots. The slid-n-fill design makes the top refilling way easy. And the specially designed mesh drip tip will prevent any spit back. Revenger and NRG tank series make a perfect combo to provide a superb vaping experience. Introducing you to the newest addition of the Geekvape Medusa family- Medusa Reborn. This tank has been given a upgrade since the Medusa for sure. It is added a quick access system making refilling easier than ever and an advanced build deck especially designed for clapton and staggered coils - great news for experienced vapers! Compared with the previous Medusa tank, the e-juice capacity has also increased to 3.5ml capacity and is now compatible with both 810 and 510 drip tips. The new RDTA also boasts an adjustable side airflow, which is obviously good for producing delicious flavors and big clouds and it is even still possible to produce a squoke mod by replacing its gold-plated bottom feeding pin! If all of that wasn't enough the new color options, rainbow and blue, will make sure your new purchase will not go unnoticed! Extra! Extra! Europe’s biggest vape convention - the Vaper Expo UK 2017 is fast approaching. It’s a carnival belonging to the exhibitors and visitors from all corners of the globe. The first show was held in 2015 and within just two years the show has quadrupled in terms of size, number of exhibitors and visitor attendance. So how can you miss this must – attend vape expo? Now we can’t keep calm to tell you the good news that Heaven Gifts will be there, too. Would you want to meet us there to have a deeper communication? Welcome to the booth J75. Our professional colleagues, new products, amazing prizes & gifts are waiting for you. 3.Register on our website to have chance to spin lucky wheel to get prize. (Old customers have chances too). Let’s make the Vaper Expo UK 2017 big. Introducing the new Kit from Wismec, a masterpiece joint designed by Jaybo and Sinuous, the Exo Skeleton ES300. It has a top 0.66inch OLED display and user-friendly interface, the mod itself comes with two or three replaceable 18650 cells whose maximum output can reach 200W or 300W for your preference. Featuring the retractable top fill system and bottom airflow control, the atomizer with brand-new WT series coils will provide you with optimal flavor and huge cloud. Powerful yet intelligent, the replaceable decorative cases in attractive colors make the whole setup much charming and unique. This time you have chance to win this IJOY Captain. It features a maximum 234w power output, supports a minimum 0.05ohm vaping. Apart from bright big size screen, NI/TI/SS temperature control function, TCR, it has a unique custom user mode. Captain also supports USB charging. It is also customizable by changing its side panels. Do you want to get your hands on this Captain mod with new technology? Here you go. We prepare 6 sets for you. It seems recently many manufacturers put much effort on introducing more sub tanks, rebuildable atomizers and gradually ignore MTL market. But now this situation will change with a newly released MTL sub tank - Vapefly Nicolas, which is 22mm in diameter, 3ml in e-liquid capacity, just fits for most mods and your regular use. It features convenient top filling and a plug-pull mechanism for easy coil replacement. Its adjustable airflow control vale has 9 different airflow settings which allows for precise adjustment based on your own preference, so you can definitely find your sweet spot. The included 1.8ohm BVC coil will offer you an enjoyable MTL vaping experience with superior flavor than ever.